China – September, 2011 - Dymek participated in the China Physical Society 2011 Fall Meeting on September 16-18 in Zhejiang University. 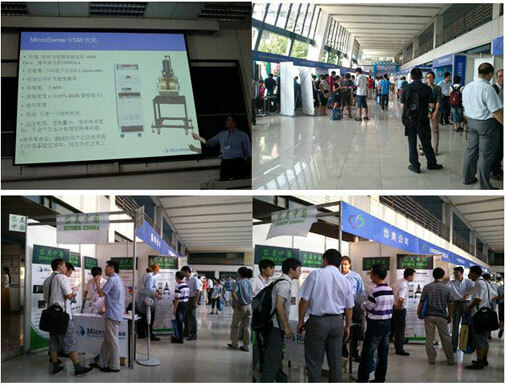 We introduced MicroSense VSM to the physics experts in the conference, and met with many existing and potential users. Erik is now the Director of VSM Business at MicroSense (formerly ADE Technologies, subsidiary company of KLA_TENCOR). He is devoted in magnetism and magnetic studies & industries since University, his PhD research study on Characterization Methods for Magnetic Recording Materials and Developed the Most Sensitive Vector Magnetometer, was subsequently commercialized by Digital Measurement Systems/ADE Technologies, then he continued working for ADE after graduate, & started his career in the magnetic field since.